The Beef CEO Mentoring Program is helping beef business owners think differently about the ‘business’ side of their beef enterprises and is already proving its worth to participant enterprises. 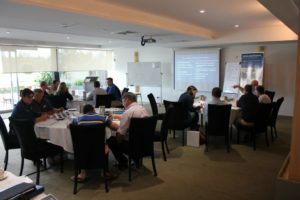 “Already the progress of some participants is astounding and it’s only been a few months since we kicked off the latest round of the Beef CEO Mentoring Program” said ABDI Program Mentor Gordon Stone. “We’ve been working through issues around succession and family dynamics, tidying up finances, staff management, having a more disciplined business mindset and engaging with the customer”, said Gordon. “It’s exciting to see how people expand their thinking when they spend the time necessary to get more clarity, focus and direction about where they want to take their businesses in future,” Gordon said. Ian Stark (and Jeanne Seifert) of Seifert Belmont Reds met a Vietnamese business group. The 12 month business mentoring program is focused on helping beef businesses get clear on where they are heading and to make sure they are investing time and energy in the most profitable activities for their businesses. 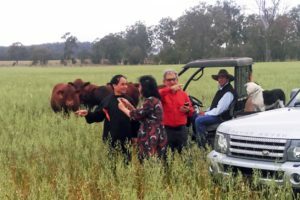 The Program is about ‘business’ more so than ‘production’, recognising that these days, an increasing source of frustration for beef business owners is the ‘business side of things’. For example managing business growth, succession planning, financial management, staff management, engaging with customers and developing systems. Participants work through the ABDI 12 Pillars on Business Best Practice which provides a solid foundation on which to grow their businesses. Personal mentoring sessions provide the opportunity for participants to get support when working through the main issues for their own enterprises. Participants work with mentors around key business issues for their own enterprises. The next intake commences on the 11-12 May in Brisbane. More information on the program can be found here, or contact Gordon Stone from ABDI on (07) 4615 2255 or info@abdi.com.au. The Beef Business Mentoring Program is supported by the Agri-Business Development Institute (ABDI), MLA Donor Company, AgForce, the Queensland Department of Agriculture and Fisheries (DAF) and Crowe Horwath.